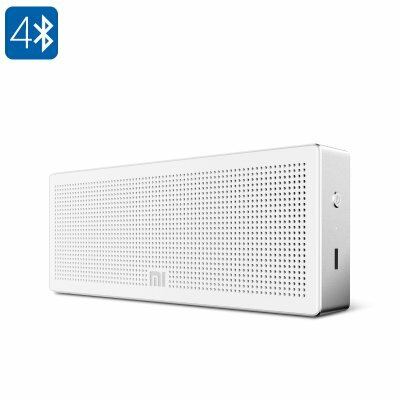 Successfully Added Xiaomi Mi Bluetooth Speaker - Bluetooth 4.0, 1200mAh, 2x 2.5W, 80dB, 10 Meter Bluetooth Range (White) to your Shopping Cart. With this Xiaomi Mi Portable Bluetooth Speaker, you will be able to listen to all your favorite songs no matter where you are. Its highly portable design allows you to conveniently carry it along wherever you go, allowing you and your friends to listen to music at all time. Its durable ABS design has been covered in an aluminum alloy boxing, giving it a high-end and stylish look. Whether you’re at home, in the park, or at the beach – from now on you’ll always have the means necessary to listen and share the latest songs on the go. Packing an absolutely massive 1200mAh Li-Battery, this wireless speaker provides you with a mind blowing 10 hours of continuous usage time – enough to get through multiple days without needing to worry about battery life. Its Bluetooth 4.0 connection delivers fast and high-quality audio transfers, letting you enjoy audiophile-grade music quality and thus allowing you to take the absolute most out of your smartphone music library. Compatible with the vast majority of Bluetooth devices out there, this wireless Bluetooth speaker can be easily paired with your smartphone, tablet, laptop and more. This mini subwoofer from Xiaomi packs two high-quality 2.5W speakers that, together, deliver an astonishing 80dB of sound. Crank up the volume and blast away those all time classics and let everybody in your surrounding enjoy them along with you – there is nothing the Xiaomi Bluetooth speaker can’t handle. With a Bluetooth range of 10 meters, it additionally provides you with high portability – allowing you to move around with your smartphone without disturbing its connection with your Bluetooth speaker. No matter where you’re at, with this wireless speaker you’ll always be able to enjoy the latest songs and more in stunning audio quality – making it the perfect electronic accessory to have with you at all time. This Xiaomi Bluetooth Speaker comes with a 12 months warranty, brought to you by the leader in electronic devices as well as wholesale electronic gadgets..